When small business owners and entrepreneurs think of IBM, they often mistakenly assume that IBM’s sophisticated solutions are only affordable by large corporations. And IBM sometimes lags the competition in garnering SMB mind share. But some of its offerings are actually a great fit for small and medium business (SMBs). A perfect case in point is IBM’s Smart Cloud for Social Business, which provides an online, integrated collaboration solution for file sharing, communities, web meetings, mail and calendars. 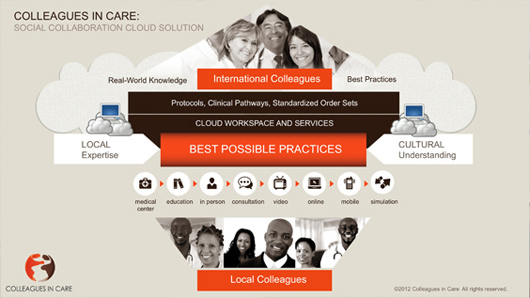 I recently had a detailed conversation with Marie Kenerson, Chief Collaboration and Learning Officer at Colleagues In Care (CIC) to learn how Smart Cloud for Social Business helps CIC achieve the effective collaboration that is vital to the organization’s mission. CIC is a nonprofit dedicated to building a medical knowledge database and volunteer network to help address the healthcare needs of Haiti. Even before the 2010 earthquake in Haiti, medical needs clearly outstripped available resources. Dr. Lisbet Hanson, a Virginia Beach OB/GYN, was in Haiti providing ultrasound training for OB/GYN practitioners when the quake struck. Just a few miles from the epicenter in Port-Au-Prince, the hospital she had taught at collapsed and all of the nurses there were killed. People in Haiti needed help, and as we all recall, there was a worldwide outpouring of aid, including that from healthcare experts around the globe that wanted to volunteer. But, connecting the dots between far-flung doctors, nurse and other professionals to create and establish sustainable practices in Haiti posed a difficult collaboration challenge. Each expert has unique areas of knowledge to contribute in areas such as treatment options, clinical pathways, and best practices, but the real value comes from putting these puzzle pieces together in a way that can be shared and replicated. Without a system to manage and collaborate on care, even the most knowledgeable people with the best intentions were unable to realize the outcomes that they had wanted to achieve. The experts would come in, and the destitute population became dependent on them. Then the experts would leave, and take their knowledge with them. A new group would come in, and the cycle would start again. There was no way to share or build upon best practices to improve care. This was the impetus for CIC. Upon her return to Virginia following the earthquake, Dr. Hanson and her cardiologist husband, Dr. John Kenerson, decided that there had to be a better way. Hanson and Kenerson established CIC to create a more collaborative, replicable way to catalyze the global network of healthcare volunteers that wanted to assist Haitians. Their goal was and reamains to establish a navigable social network to bring expertise into Haiti–and provide the professional development that those staying in Haiti so desperately need. To help enable this, CIC applied for and received an IBM Trailblazer grant for IBM SmartCloud for Social Business (then called LotusLive) to help facilitate collaboratiotn. Using the SmartCloud solution since early 2011, CIC has built its “Social Collaboration Cloud Solution,” which is a collaborative learning system dedicated to transforming healthcare delivery in Haiti by fostering “CollaborHaitian.” CIC is building a medical knowledge and volunteer service database and Best Possible Practice models (PPBMs) that practitioners in Haiti and other resource-constrained areas can use. CIC’s approach is fundamentally different from the traditional approaches to international development efforts because it relies on mutual collaborative learning in solidarity with Haitian colleagues. ·Micro volunteers, who share specialized expertise to provide care such as screening for cervical cancer without equipment, or to build a clinic. ·Peer networks of practitioners, who are focused on specific areas, such as pediatrics or hypertension. Some are physical volunteers, who train Haitian healthcare providers to embed evidence-based quality standards into the practices and curriculum in Haiti, and others contribute online. ·Macro volunteers, who create and nurture mentoring relationships between practitioners on the ground in Haiti and vetted mentors. With SmartCloud file sharing, a peer network of Haitian and international physicians can co-create training for how to take blood pressure without cuffs, a micro volunteer can translate it into Creole and French, and then share it with the peer network–all via SmartCloud. CIC is committed to making all programs openly accessible though the governmental ministers of health to anyone interested in customizing or replicating these BPP’s anywhere, thus reducing waste, redundancy of efforts, etc. CIC also uses the meetings capability to conduct meetings between practitioners in Haiti and remote volunteers, and activities management to ensure ideas are documented, negotiated commitments to future tasks are managed and completed. Example templates for scheduling and managing travel and training program logistics make project management visible to all. Recently, CIC has also begun using IBM Docs to create and collaborate on documents. As important, SmartCloud has been easy enough for SmartCloud users, predominantly a culturally diverse group of very busy volunteers who donate time and expertise in incremental chunks, to learn and use on a sporadic basis. SMB Group research studies indicate that teamwork and collaboration–or lack of it–effect an organizations’ financial performance as well as employee (or in this, case, volunteer) satisfaction. Organizations that are more collaborative have a decided edge over less teamwork-oriented counterparts. This is not surprising. Whether you’re the CEO or a doctor, an accountant or a volunteer, you need to share and manage information, ideas, resources and connections to get the job done. Cloud-based, integrated collaboration tools such as SmartCloud for Social Business help organizations share knowledge, streamline processes, and keep everyone in the loop to gain that edge. This is more important than ever, as digital information continues to grow at an exponential rate. CIC may face more urgent challenges than most private-sector small and medium businesses (SMBs) or even other non-profits when it comes to harnessing, applying and replicating knowledge-based practices and communities. But SMBs, as well as other non-profits, have just as much to gain by adopting a more integrated, collaborative approach to meet their challenges and gain their own unique edge. This blog was sponsored by IBM to help educate small and medium businesses (SMBs) about how collaboration tools and social technologies can help their businesses. Next Next post: Is Big Data Relevant for SMBs? Hello! I’ve been reading your website for a long time now and finally got the courage to go ahead and give you a shout out from Kingwood Tx! Just wanted to mention keep up the good work!